Lex Luthor: Man of Steel #2 © 2005 DC Comics. COVER ART BY LEE BERMEJO. Called “the maddest of mad scientists” by writer/artist John Byrne in his introduction to DC Comics' The Greatest Superman Stories Ever Told (1987), Superman's arch-enemy Lex Luthor— pronounced “lew-thôr,” although “Luther” is a common variation (and at least one diction-challenged lackey has been known to say “lew-tor”)—bowed in Action Comics #23 (1940), in “Europe at War, Part 2” (continued from issue #22) by Superman's cocreators, writer Jerry Siegel and artist Joe Shuster. A generic, paunchy fellow with a shock of red hair, Luthor's audacious actions compensate for his lackluster looks. He plans to dominate the world by inciting combat, and operates from a sophisticated sky-headquarters kept airborne by a dirigible. In Superman vol. 1 #4 (1940), the red-headed rogue now presides over an underwater city from which he assails the planet with an earthquake-producing machine. As Luthor brazenly challenges Superman to engage him, writer Siegel established the defining dynamic between these arch-enemies: mind versus muscle. Contemporary fans may have a difficult time imagining the famously hairless Luthor with red locks (a colorist's gaff gave the mad scientist gray hair in Superman #5, 1940), but in “The Invisible Luthor” in Superman #10 (1941), by Siegel and artist Leo Nowak, more than Luthor's body had vanished: he was now bald (although a hairless Luthor had previously appeared in the Superman newspaper strip). In his screen debut, in the fifteen-chapter Columbia Pictures movie serial Atom Man vs. Superman (1950), Luthor (Lyle Talbot, who one year earlier played another DC character, Commissioner Gordon, in the serial Batman and Robin), aka “Atom Man,” imperiled the city of Metropolis with a ground-shaking “Directional Cyclotron” and had perfected teleportation for getaways. Fantastic weapons were the trademark of “Superman's most inveterate hater” (as he is described in Action #47, 1942) who, in the comics, also used electricity to make himself super, then battled Superman for the Powerstone, an artifact that granted limitless might (Superman #17, 1942). Luthor was sometimes abetted by “fumbling underlings” (one of whom from Luthor's first adventure was bald and wore a white lab coat, the spitting image of what Luthor himself became) for whom he held little regard, even sacrificing their lives to salvage his plans or to escape capture. Luthor relied less upon flunkies beginning in the 1950s, but sometimes partnered with other supervillains—the Prankster, Mr. Mxyztplk, the Toyman, and the Joker—motivated by writers' whims to be chummy (“This chance meeting may be the luckiest thing that ever happened!”) or crummy (“This is all your fault, you grinning clown!”). The 1950s were unkind to Luthor. He mellowed into a two-dimensional, not-so-mad scientist in a business suit, looking more like a mobster than a mastermind, and was snubbed by producer Whitney Ellsworth from the live-action television series The Adventures of Superman (1952–1957); the show's meager budget limited its villains to humdrum hoodlums—which, ironically, is what Luthor had become. It took Silver Age (1956–1969) Superman editor Mort Weisinger to restore Luthor to prominence as “a character of limitless ambition,” as Les Daniels called him in Superman: The Complete History (1998). In Adventure Comics #271 (1960), the villain's origin was finally told, not in a Superman tale but in “How Luthor Met Superboy,” by writer Siegel and artist Al Plastino. Smallville resident Lex Luthor, a teenage scientific prodigy, was friends with the Boy of Steel until Superboy inadvertently caused Lex to permanently lose his hair when using his superbreath to extinguish a fire in Lex's laboratory. Driven mad by the incident, Luthor irrationally accused Superboy of causing the accident out of jealousy over his intellect and dedicated his life, and his science, to proving that he was the Boy of Steel's superior (his humiliated family slithered out of town, changing their name to “Thorul”). The Superboy/young Lex relationship inspired the producers of the WB's live-action television drama Smallville (2001–present); the series chronicles the adventures of pre-superhero Clark Kent (Tom Welling), with Michael Rosenbaum as Lex Luthor, the son of callous capitalist Lionel Luthor (John Glover), as Clark's friend and a supervillain-in-the-making. The adult Luthor chose gray prison drabs as his felonious fashion statement in the 1960s, his reminder of the years of his life wasted behind bars after being arrested by Superman (an action figure of this version of Luthor was produced by DC Direct in 2006). Luthor's loathing knew no bounds. He wished not to merely vanquish the Metropolis Marvel, he aspired to kill him, launching depraved schemes—turning himself into an irradiated “Kryptonite Man,” challenging Superman to a death duel under a red sun (under which Superman has no superpowers), creating the backwards-Superman duplicate Bizarro, and teaming with Brainiac among them—to bury his enemy, often working from Luthor's Lair, the name given a variety of sophisticated headquarters secreted in abandoned museums, observatories, and mines, their lead-lined walls shielding the evil scientist from the prying Xray vision of his arch-foe. In his Lair, Luthor erected statues of some of history's most infamous figures— including Genghis Khan, Atilla the Hun, Blackbeard, and Benedict Arnold—from whom he drew inspiration. He often kidnapped Superman's friends Lois Lane, Jimmy Olsen, and Perry White to lure the hero into his nefarious traps. This version of Luthor was featured in several episodes of Filmation's animated The New Adventures of Superman (1966–1970). Despite Luthor's malevolence, Superman maintained faith in his former friend, hoping that he would reform and once again devote his genius to the good of humankind. During the Silver Age, snippets of Luthor's humanity emerged. He took great strides to ensure that his younger sister Lena Thorul did not discover that he was her disowned brother, and befriended a beleaguered planet that regarded him a hero; on this world, named Lexor by its grateful inhabitants, Superman was considered a criminal and Luthor had a life separate from his earthly supervillainy, including a wife, Ardora. While Luthor's modus operandi changed very little during the 1970s, his appearance did; he slimmed down and donned a purple-and-green battlesuit equipped with jet boots and weaponry. This costumed Luthor was popularized on Saturdaymorning TV on ABC's Challenge of the Super Friends (1978–1979), as the ringleader of the contemptible Legion of Doom. In December 1978, Oscar-winning actor Gene Hackman brought Luthor to life in director Richard Donner's blockbuster Superman: The Movie. More a manipulator than a renegade scientist, Hackman's Luthor was a smooth-talking, scene-stealing deceiver, joined by dimwitted accomplice Otis (Ned Beatty) and voluptuous mistress Miss Techsmacher (Valerie Perrine). Hackman was not required to shave his head to portray Luthor; he wore toupees throughout the movie, only doffing his rug at the movie's end (and revealing a bald wig). Hackman reprised the Luthor role in Superman II (1980) and Superman IV: The Quest for Peace (1987), the latter film introducing an insipid nephew, Lenny Luthor (Jon Cryer). The comic-book Luthor was mentioned in novels produced in conjunction with the first two movies, Superman: Last Son of Krypton (1978) and Superman: Miracle Monday (1981), both by Elliot S! Maggin, one of the most prolific writers of Superman comics during the 1970s. Luthor's uniform was upgraded into a sophisticated “war suit” as part of Superman's 45th anniversary celebration in Action Comics #544 (1983). This new look, conceived by artist George Pérez, made Luthor more on par with Superman, but this “robo”-Luthor was short-lived. Superman was rebooted in 1986's Man of Steel miniseries, written and penciled by John Byrne. This new continuity reinvented Luthor into a multi-faceted, constantly evolving figure first seen in a role brainstormed by writer Marv Wolfman: white-collar criminal. The mega-rich tech whiz behind the ubiquitous corporation LexCorp, Luthor was the big man in town until the arrival of Superman (who no longer began his career as Superboy) usurped his position as the Daily Planet's chief headline-maker. A fundamentally unlikable powerbroker known for crushing business opponents and coercing female subordinates into sexual relationships, Luthor, untrustworthy of the alien from Krypton who professes to safeguard “his” city, has devoted his wealth and intellect into eliminating this superpowered trespasser. In the years since Man of Steel, Luthor has created the Superman foes Metallo and Bizarro, developed cancer from wearing a kryptonite ring, had his cancer-ravaged hand amputated and replaced with a steel fist, faked his death, transplanted his brain into a younger clone he passed off as his red-headed son, transplanted his brain yet again into another cloned body identical to the original, and organized the anti-Justice League team the Injustice Gang. He has committed various crimes along the way, always stalemating Superman, who was wise to Luthor's machinations. Luthor's ultimate power play began in 2000 when he was elected president of the DC Universe's United States in a divisive campaign that rivaled the real world's hotly contested Bush v. Gore election (Superman: President Lex, 2000). In the story arc “Public Enemies” in Superman/Batman #1–#6 (2003–2004), President Lex manipulated public opinion by blaming Superman for a kryptonite asteroid threatening Earth, leading the hero and his ally Batman to work outside of the law to bring down Luthor's presidency. A desperate, near-insane Luthor fought back wearing a battlesuit (a slightly modified version of Pérez's 1983 design), but was ousted from office in disgrace. In the miniseries Villains United (2005) Luthor, sans armor, was seen in full control of his faculties, working underground as the organizer of a supervillain conclave called the Society. Was Luthor a rampaging metal-suited supervillain or a wily criminal strategist? 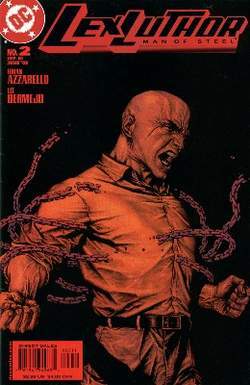 Villains United #6 disclosed the startling coexistence of both versions: The Society's leader was revealed as an alternate-universe Luthor, while ex-President Lex was exposed as “Mockingbird,” the mysterious player behind the Secret Six, the criminal alliance that stood opposed to the Society. This startling revelation created the unusual scenario of Luthor being his own arch-foe, with their struggle unfolding in the continuity-rewriting crossover Infinite Crisis (2005–2006). With duplicity and genius as his guides, Lex Luthor—no matter his form—remains the most dangerous threat to Superman, and to the world. Voice actor Michael Bell was the first person to play the post-reboot Luthor, in Ruby-Spears' Superman cartoon (1988–1989). Luthor has also appeared in each subsequent TV screen adaptation of the Superman legend: the live-action Superboy (1988–1992, played by Scott Wells and Sherman Howard), Lois & Clark: The New Adventures of Superman (1993–1997, portrayed by John Shea), and Smallville; plus the animated Superman (1996–2000), Justice League (2001–2004), and Justice League Unlimited (2004–present), with Clancy Brown voicing him in each. Kevin Spacey brought the bald bad guy to life in Brian Singer's blockbuster movie Superman Returns (2006); an earlier, unrealized version of the movie pegged Jack Nicholson for the role. Lex Luthor has been consistently merchandized since the 1978 movie, particularly through a variety of action figures (including a peculiar 1989 version whose “power punch” enabled the toy to hit itself in the eye); the classic mad-scientist Luthor was produced as a mini-bust in the mid-2000s, and in the 1950s through the 1980s was depicted on Superman lunchboxes, puzzles, and board games.